Symbol Badge Pack: Spruce up any outfit with these four simple yet striking badges! 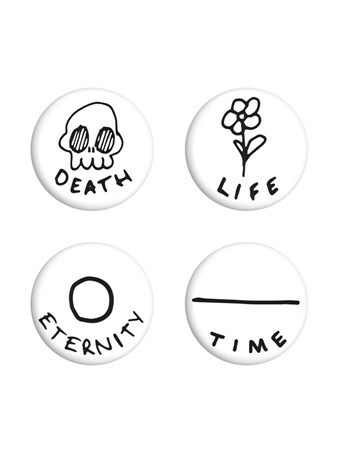 Coloured in a crisp white, each badge holds a bare design marking four huge aspects of human life. A small flower illustrates life, a sketched skull is death, a straight line is the continuation of time and finally a joined circle is lasting eternity. Anyone looking for a unique set of accessories would be dying to get their hands of these creative badges. High quality, framed Death, Life, Eternity, Time, Symbolic package badge pack with a bespoke frame by our custom framing service.